In a near unanimous vote at the United Nations General Assembly on Tuesday, the vast majority of the world voted to put an end the U.S. economic embargo against Cuba. The last time the United States had normal relations with Cuba, the Andy Griffith Show was the most popular show on TV, African Americans couldn’t vote, McDonalds only had 228 locations, and Barack Obama would not be born for another year. In a near unanimous vote at the United Nations General Assembly on Tuesday, the vast majority of the world voted to put an end the U.S. economic embargo against Cuba. Aside from the moral argument, the driving principles behind the vote to end the embargo were those regarding the sovereign equality of states, non-intervention in internal affairs, and the freedom of international trade and navigation. In total, 188 countries voted in favor of the resolution, with the U.S., Israel, and Palau voting against it, and the Marshall Islands and the Federated States of Micronesia abstaining. It was the twenty first consecutive year that the resolution passed by an overwhelming majority in the U.N. The last time the United States had normal relations with Cuba, the Andy Griffith Show was the most popular show on TV, African Americans couldn’t vote, McDonalds only had 228 locations, and Barack Obama would not be born for another year. It was indeed a different world. "Photo Credit: The Right Perspective"
It was thought that President Obama knew this as well when he made headlines in 2009 by stating that he sought “a new beginning” with Cuba, as the outdated and damaging policy was more ideological than practical, Tuesday’s vote showed that when it came to the embargo, nothing has changed. The embargo began in 1960 when the United States sought to punish revolutionary Cuba for nationalizing properties which previously belonged to U.S. corporations and citizens. To put things in perspective, after Cuba gained “formal” independence in 1902, it was still governed largely by the neo-colonial Platt Amendment. This imposition stipulated that the Cuban government could not make alliances or sign treaties with any foreign government without the permission of the United States. Article III of the Amendment stated that the government of Cuba must consent to the right of the United States to intervene in Cuban affairs for “the preservation of Cuban independence, the maintenance of a government adequate for the protection of life, property, and individual liberty.” Thus the Platt Amendment set the stage for repeated U.S. intervention in Cuba in 1906, 1912, 1917, and 1920. While the Platt Amendment was scrapped in 1934 under President Roosevelt's Good Neighbor policy, U.S. companies already dominated the Cuban economy, which owned 60% of rural properties, 90% of Cuban mines and mineral exports, and 80% of the utilities and railroads. The United States also backed business-friendly strongmen which ensured that the neo-colonial status quo would continue. Students of American history would be right to recognize that a similar pattern of foreign economic control sparked their very own revolution in 1776. While the Cuban embargo was ultimately created to isolate Cuba economically and politically, the routine imposition of harsher conditions has failed to bring down the Castro government. In 1992, President George H. Bush signed the Cuban Democracy Act (also known as the Torricelli Act) into law, which forbids subsidiaries of U.S. companies from trading with Cuba, U.S. nationals from traveling to Cuba and remittances being sent to the country. The Cuban Democracy Act also attempts to limit the amount of interaction the international community has with Cuba by “imposing sanctions on any country that provides assistance to Cuba, including ending U.S. assistance for those countries and by disqualifying them from benefiting from any programme of reduction or forgiveness of debt owed to the USA.” It was widely assumed that after the fall of the Soviet Union it would only be a matter of time before Castro fell as well. When that prediction didn’t materialize, President Bill Clinton signed the internationally condemned Cuban Liberty and Democratic Solidarity Act in law (more commonly known as the Helms-Burton Act) in March 1996. This act further deepened the sanctions against Cuba as it sought to “strengthen international sanctions against the Castro government,” and to “plan for support of a transition government leading to a democratically elected government in Cuba.” The Helms-Burton Act allowed for any non-U.S. company that dealt with Cuba to be subjected to legal action and that the respective company's leadership could be barred from entry into the United States. This essentially meant that many international businesses were blackmailed to choose between operating in Cuba or the United States—which financially speaking isn’t much of a choice in regards to market size. President Jimmy Carter highlighted the failure of the embargo in September, when he stated that "We should all continue to press the Cuban government to respect individual rights and more political openness, but the embargo undermines any credibility that [the United States] has in calling for improvements in Cuba." While the world has called on the United States to “act on the right side of history” by lifting the crushing and unnecessary economic embargo on Cuba, it must also remove Cuba from the U.S. State Department’s list of Sponsors of State Terrorism. This position is highly problematic, as the United States has actively engaged in over 50 years of economic and covert destabilization in Cuba, going so far as blindly protecting wanted terrorists such as Luis Posada Carilles and Orlando Bosch, both former CIA agents accused of dozens of terrorist attacks in Cuba and the United States. The double standard of dealing with noted human rights abusers such as China, Saudi Arabia and Colombia, while isolating Cuba, does not make sense. 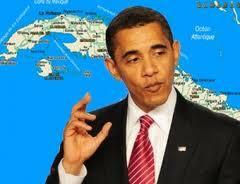 Obama’s re-election has meant that he is no longer captive to a potentially extreme anti-Cuba voting bloc in Florida. In fact, calls for normalization of relations with Cuba have been on the increase. Given that Obama has stated that “I am not interested in talking for the sake of talking, but I do believe that we can move U.S.-Cuban relations in a new direction”—it is time for meaningful, progressive engagement with Cuba to occur. Tuesday’s vote showed how out of touch America is on this issue. Given the other foreign relations nightmares Obama has both inherited and created, normalizing relations with Cuba would be a realistically achievable and just goal for his second term.